Thursday was a fun day – more after the jump. The game wasn’t particularly exciting, although Matthew is certainly a fun player to watch. 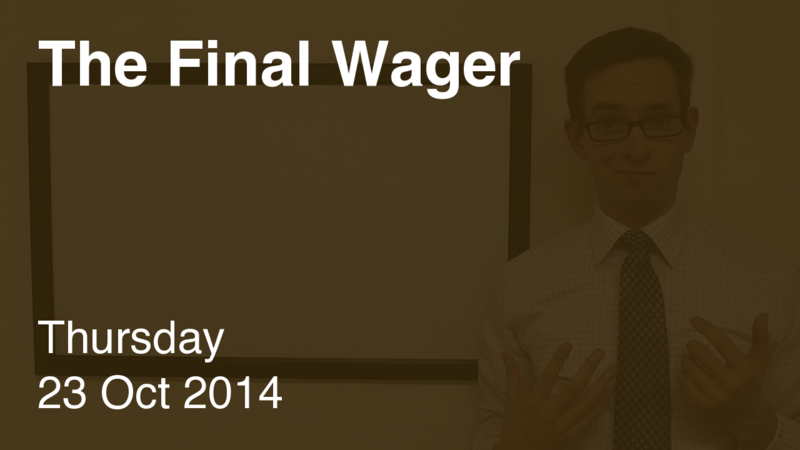 Matthew has it locked up, and can wager up to 4,000. Angela doesn’t need to wager anything to guarantee second, but she could wager up to 6,000 safely. Merry Christmas, Ali! Here’s $1,000 more for your troubles. For those of you who don’t follow me on Facebook, I dug up my TOC quarterfinal game. The introduction is hilarious. Check out that eyebrow-raise! That smirk!